Apple Inc (AAPL) shares have hit an all-time high of $600.01/ share (before closing for the day at $585.56/ share), giving the company a $545 billion valuation, making it the largest company in the world in terms of market capitalization. This happened right after the first batch of “the new iPad” was sold in Australia (from telecom company Telstra’s stores); soon to be followed by sales in Japan, Germany and the US, from retailers like WalMart, Best Buy & Radio Shack apart from Apple’s own Apple Stores. The company shares reached $500/ share only a month back and the share price has jumped 44% this year alone. Apple could be valued even higher, according to Morgan Stanley Analyst Ms. Kathryn Huberty, who revised her target price from $515 to $720, predicting that the company would go to $960 (or higher) on a $80 Earnings Per Share (EPS) in 2013. This is based on a Price-Earning Ratio (P/E) of 12, which is at the lower end of Apple’s historical forward P/E (currently at approx. 17). Morgan Stanley is not the only firm revising their prices upwards, earlier Piper Jaffray and recently Oppenheimer & UBS also have revised their target prices for AAPL. I am sure, others institutions will soon follow suit. IF Ms. Huberty’s price predictions for 2013 come true, that would give Apple Inc. a market valuation to the tune of a mythical $1 trillion! Investors are moving away from economy-dependent assets like T-Bills, currencies and from firm-dependent securities like stocks and bonds to economic performance-independent commodities (unlike oil) as safe-haven instrument while markets, particularly equities, continue to tumble all around us. Specifically, there is a rush for gold. The graph shows the sharp price rise of gold in August. However, the most telling sign is the volumes traded in recent times, compared to over the previous months. 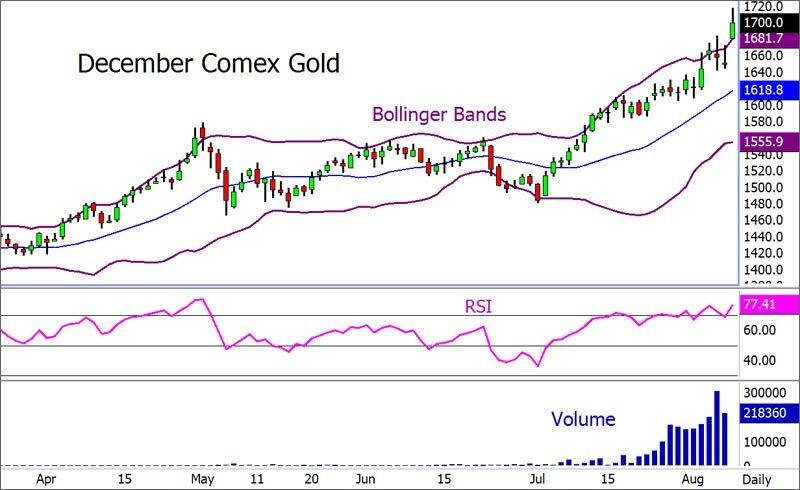 Noteworthy is the high RSI (Relative Strength Index), which is generally indicative of an overbought situation, although here supported by price increases and prices touching the upper Bollinger. In other words, technically speaking (if you subscribe to such views), “sell” is still not signaled, since the indicators are not divergent.